YouTube is providing opportunities for many to make a living and to pursue a career as full-time YouTuber. While there are people making millions of dollars, there are others who are earning a comfortable income by becoming a YouTuber. To earn money on YouTube, one must first start a YouTube channel. Create high-quality content regarding video quality and also the content quality. Create proper thumbnails for your videos to look professional and to make people understand that you are taking YouTube seriously. When your channel starts getting views you can make money from direct advertising revenue on YouTube. SEO your videos to get more views. Use proper keywords in the title, tags and descriptions. Affiliate income is one of the ways to earn money by becoming a full-time YouTuber. Promote the products that you use and enjoy. Choose affiliate products that are related to the niche and promote them. Add the product to your old videos. You can also create new videos featuring the affiliate product. Draw traffic to your channel by creating videos on product reviews and unboxing. 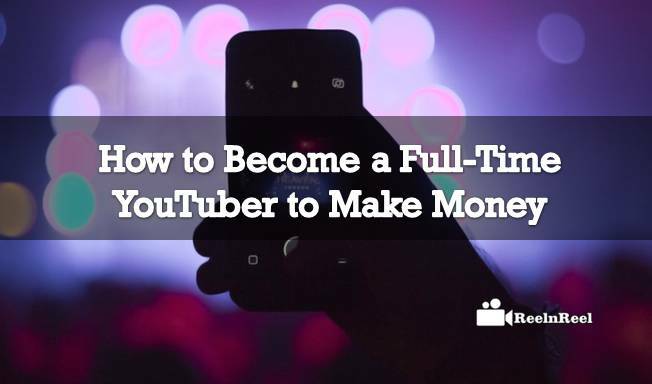 To earn money by becoming a full-time YouTuber you need to find ways to get paid by YouTube. One of the best ways is to put the ads at the beginning of the videos. When viewers watch at least thirty seconds of the video, you can make money. Getting your videos sponsored is another way to earn money. Make a video about involving a product of the advertiser, and this can give a chance to earn more money than from normal ads. Sponsorships, product placements are other ways of earning revenue on YouTube. Finally, it is not quite easy to become a full-time YouTuber and earn lots of money. It takes a lot of time, patience and hard work.